I watched We'll Take Manhattan on BBC4 featuring Bailey who is such a legend in his own studio time. I have worked with him a few times and he has always been inspiring AND entertaining. We shot Paloma Picasso, Jerry Hall, Germaine Greer, Catherine Bailey and Nicole and Natalie Appleton (All Saints) for different magazines inc W Magazine and Tatler. Every shoot has a story. 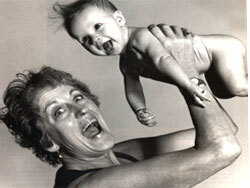 My favourite shoot was with Germaine Greer photographed by Bailey with a baby boy for Aura magazine. She swung him, nappyless, high in the air for the shot. He peed right in her face - I guess he did that on behalf of men's lib! Bailey can be quite demanding - and machiavellian. He requested windsurfing props for shooting Jerry Hall in swimwear so I went to great lengths to arrange for a friend from the South Coast to deliver boards, booms and sails to his loft studio. On the day, Bailey decided not to use them but spied some very contemporary chairs in the corner that he said we should shoot with Jerry instead. A couple of weeks later I was talking to a fashion editor from Elle who said that she had just shot with Bailey and she was a little peeved that he had made her get in some props that he never used. Oh, I said, the same happened to me. What did she have to organise? Some very contemporary chairs. Haha, the very same ones we used for our shoot!